We will be posting all are race reports and results here. A history of previous race reports and result can be found here. Sian Morgan Winner 750m race. The final race in the OWS Swim Race evening series saw records tumble as David Stannard – Reading SC swam the 3.8km in 50.18. Other great performances came from Sian Morgan in the 750m and Hannah Kitchen in the 1500m. With summer almost over and the lakes cooling down, crisp conditions greeted the athletes racing the final event in the OWS Aquathlon series. With The Chicago Grand Final in two weeks time, elite athletes India Lee and Hannah Kitchen both decided to race in preparation for their trips over to the States. As the horn sounded the girls shot to the front with Hannah leading the way. India’s tactics were clear from the outset – to stay on Hannah’s feet for the 750m swim and out run her on the 5km run course. Hannah had a different plan and kept surging in the swim to get a small gap over India. In to T1 and it looked like Hannah’s attempts to drop India had failed as Indie stayed right on Hannah. However, Hannah initiated plan B – drop India in transition. 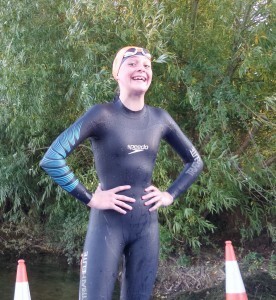 This she did gaining a good advantage out of the wetsuit and on to the run. Both girls flew out of transition with a significant advantage over the rest of the field. Following the girls out of the water was the young Lucas Boardman (15) however, a struggle with his wetsuit in transition meant he was 5th going out on to the run. Slick T1’s by Sharkie Jaggard and Leon Harris allowed them to give chase to the racers up front. Just behind the three men out of the swim was Lou Fox having recovered from last weeks Xterra European Championships in Surrey; she was now on her favorite discipline, the run. Despite Hannah’s fast T1 and opening lap, India caught and past Hannah and delivered the fastest run of the day, a swift 17.38. Hannah finished second with an 18:35 run and coming through the field with an 18:40 run to finish third was Lou Fox, making it an all female podium. Despite the cooler temperatures, we saw some fast race times and run PBs from a number of our returning athletes including Steve Oliver and Sandra Buckton – both of whom went on to take the silver medal for the series in their respective age categories. Also joining the “Sub30 minutes club” was Leon Harris and Sean Stewart. A solid run from Lucas Boardman meant he finished top junior and top junior for the whole series. Other series winners were Michael Fabes (Overall Male Champion) and Mel Brookes (Overall Female Champion) both taking the trophy for a second season. The OWS Aquathlon Series will be back for its eighth season in 2016. We would like to thank series sponsors PowerBar, Stroke Crank & Scarper and Nameonkit.com for their contributions and continued support. There were stunning conditions again for Race 4 of the OpenWaterSwim.co.uk. Aquathlon (swim 750m run 5km). A thin mist covered the lake at 5am as the Triathlon Training Center team arrived to set up for the morning’s racing. 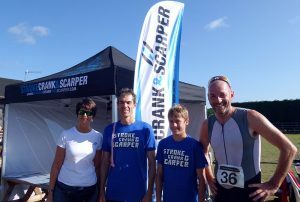 Joining them, were Aquathlon series sponsors, Andrew and Amanda from Stroke, Crank & Scarper. Course record holder Michael Fabes (17) was starting his weekend with the Aquathlon and then planning to race a triathlon on the Sunday – something he will try to repeat at the World Championships in North America later this year. India Lee was using the swim portion as training for her upcoming Olympic Qualifying race in Rio and we also had two junior athletes Lucas Boardman (15) and Hugo Hewitt (14) looking to increase their experience with open water multi-sport racing. As the gun sounded there was a flurry of arms and legs as Julian Swain, a 50m sprint freestyle specialist, went for broke to make it to the first buoy in the lead to gain an advantage over his brother Austin. This he did but, as is customary with sprinters, he promptly discovered some lactic acid just the other side of the first buoy. Julian’s lead was quickly dissolved and a group of four athletes including India Lee, Lucas Boardman, Austin Swain and Michael Fabes formed at the front. As the swim progressed India and Michael pulled away from the other two and it was India who climbed out of the water first. Michael, who is our series leader, was through transition and out on to the run in just under the 10 minute mark (9:59). Second out onto the run was the young Lucas Boardman nearly a minute up on his time from race 2. In the women’s race Jan Scott was out of the water 8 seconds up on her previous best trying to gain as much advantage on European Aquathlon Bronze medalist and fast runner Mel Brookes. On the run Michael Fabes was able to settle into his long ranging stride and pull away from the field for the victory in 28:28. But it was Xterra Pro athlete Jon Heasman who was moving through the field, fifth out of the water he ran himself up to second place in 30:16. Third over the line with another solid run was Mel Brookes in 31:15. But it was in the junior race where personal bests tumbled – Lucas Boardman raced to a massive pb of 32:55 sixty six seconds faster than race 2, he was pushed all the way by the even younger Hugo Hewitt (33:16) who is always out to beat his dad which he did! (Ivor Hewitt 35:15) other personal best performances came from Jan Scott, Greg Boardman, Neil Turner, Nick Bartlett, Paul Holmes, Sally Waterman and special mention must go to Bob Eltze who keeps getting faster with a nearly four minute personal best. 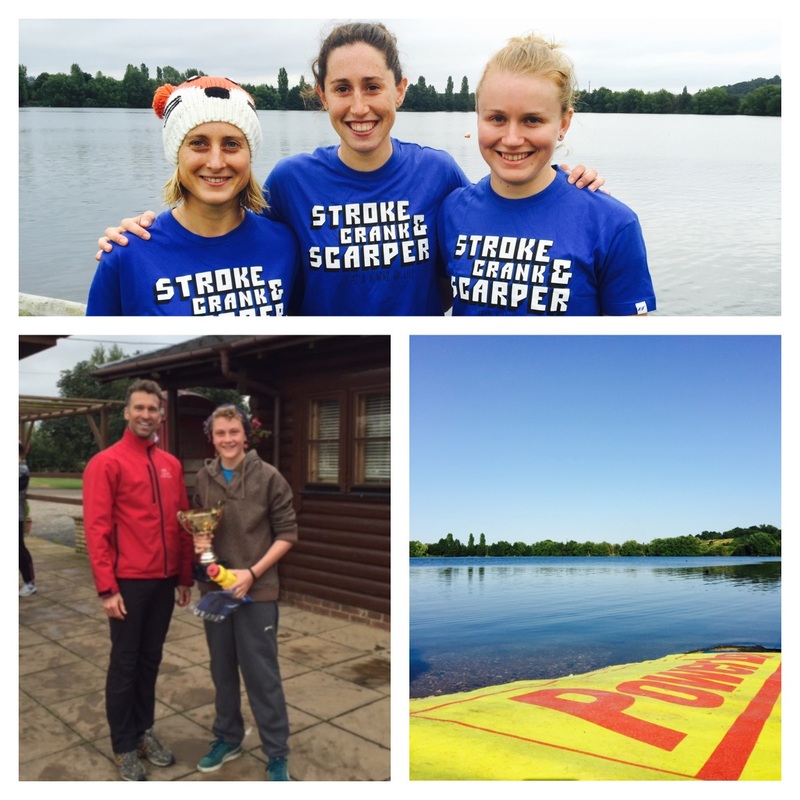 The next race in the OWS Aquathlon Series is on the 8th August enter here. A quiet and still morning greeted the swimmers and aquathletes at the Triathlon Training Centre in Little Marlow Saturday morning. After a light drizzle as the athletes set up in transition, the clouds parted and the sun began to shine as the swimmers lined up on the start line. At 7:45am the horn sounded for the “race in pink” and it was Kai Furnell- Brennan who moved straight into the lead with his fast start. Hannah Kitchen who is preparing for the European Aquathlon Championships along side course record holder Michael Fabes was quickly on to Kai’s feet. Covering that move was India Lee who is also preparing for a European Championships, the Triathlon champs in Geneva next month, on her feet was Michael trying not to let any of the lead trio get away. With the field of pink stretched out across the lake the lead four moved away from the chasers, and as they turned at the far side of the lake Hannah moved into the lead closely followed by India. With these two only doing the swim as preparation, Kia and Michael were able to use the girl’s pace to pull them along. As they hit the shore and climbed the boat ramp it was clear the pink race was also the fast race, with Hannah and India reaching the shore in 9:28 some ten seconds faster than Hannah’s swim record. Kia and Michael soon followed and with Michael through transition fastest he was out onto the run in 10:06, 34 seconds faster than in Race 1 of 2015 and 21 seconds faster than when he set the record in August of 2014. Other notable swim performances came from Jan Scott (50+), Mel Brookes(40+), Ian Bennett, Steve Oliver(50+), Neil Turner(40+), John Pryor(50+) and Paul Holmes(40+) all significantly faster than previous performances. With all the dry weather we have had the run course was in excellent condition for some very fast runs. Michael was well into the lead following his fast swim, but it was in the women’s race that things were changing. Jan Scott had exited the 750m swim and headed out onto the run in the lead in a personal best swim and transition time of 12:37, but hot on her heels it was the 2014 series champion Mel Brookes who had swam and got out of her wetsuit almost 45seconds faster than her previous best and with her strong running pedigree she was going to be tough to beat. She moved into the lead early in the 4 lap 5km run and was never challenged as she ran home in a personal best 31:52. Mel will also be competing in the European championships as too will second placed Jan Scott. In the men’s race Michael continued to dominate and pull away from the challengers he crossed the line in a course record 27:14, 16 seconds faster than his previous record. Second across the line was Kia and third over the line with her personal best race was Mel. Further down the field were some other significant performances and personal bests. Steve Oliver(50+), Neil Turner(40+), John Pryor(50+) and Paul Holmes(40+) were not only faster in the swim but also in the run with Steve seeing the most significant improvement this season some 4 minutes and 45 seconds faster than early May. Paul Holmes and John Pryor were both well over 3 minutes faster. We would like to think that both consistent training and some inspiration from “The Pink Lady” help achieve these times. Well done to all the competitors on a great days racing and especially Lucy for her wonderful idea and dedication. RIP Katie Henderson. The next OWS Aquathlon is on the 18th July 2015 enter online here. A low mist on the lake greeted the first swimmers as they entered the water for their morning swim at the Triathlon Training Centre in Little Marlow. By the time the aquathletes were on the start line over an hour later, the lake was basking in sunshine on the most stunning morning of the season so far. With the water temperature rising, it was Austin Swain (50+) who lead out of the water in 10:57 however nursing his plantar fascia on only his second run in 8 weeks, he was always going to be vulnerable on the fast and flat 5km run. Next to emerge from the still waters was Lucas Boardman (Junior) in a time of 12:03, some 40 seconds faster than his previous best. Not far behind Lucas was Clark Schofield 12:19 who looked strong going on to the run. First women out of the water and through transition was Louise Fox, taking a break from Xterra tour racing. Out on the run and Austin’s lead was rapidly being eaten away by both Clark and Louise. Clarke, who had cycled to the race, managed to hold on for victory with a great 18:12 5km run. Louise, who could see Clark ahead but could not manage to close the gap, crossed the line in 2nd place overall and first female with a great 18:26 run. Lucas ran a PB (21:58) to win the junior race showing his father Greg Boardman a clean pair of heels in the process. A special mention must go to our many first timer aquathletes and those tackling their maiden race at the Triathlon Training Centre. The OWS aquathlon series provides a great opportunity to experience the race environment, in a friendly relaxed setting. Join us on 20th June for the next race in the series – entries available online at http://www.triathlontrainingcentre.co.uk/aquathlonseries/. The Triathlon Training Centre holds events and training sessions all summer long and is the home of OpenWaterSwim.co.uk – head to www.triathlontrainingcentre.co.uk for more information. On a very cold and blustery May day at the lake seven brave souls attempted the 3.8km or 1500m swims at the 2nd Thursday of the Month OpenWaterSwim.co.uk race series. It was OWS race regular Kevin Ormerod who emerged from the lake first at the end of a very tough 2 and half laps of the lake. Kevin covered the 3.8km swim in a great time of 1:05:45 especially considering the size of the chop on the back side of the lake. In the 1500m race it was coach versus athletes as training partners India Lee and Hannah Kitchen took on their coach Richard Stannard, Richard narrowly took victory just one second ahead of Hannah and four ahead on India. A blustery spring morning greeted the athletes at The Triathlon Training Centre in Little Marlow. The first race of the series is always the hardest with the water still warming up and the run surface a little softer than during summer. However, this did not deter the 2014 Series Champions from returning to defend their crowns. Last years 2014 series winners, Michael Fabes and Mel Brookes, both toed the start line (or more accurately palmed the start line) for the 750m swim and 5km run. Also racing was Kai Furnell-Brennan, 2014 Junior Series Champion and elite athletes India Lee and Hannah Kitchen, the 2013 and 2012 Series Champions. Kai, a member of Maidenhead Marlins swimming club along with India Lee, who was fresh off the plane from qualifying for the Rio Olympic Games Triathlon selection race later this year, both had excellent starts. But it was Michael Fabes who took the early lead. After the first turn buoy a clear front pack developed of Michael, India, Hannah, Kia and, having a great swim with those half his age, Austin Swain (men’s 50-55). The rest of the field, including several first timers, were making excellent progress in the wind swept waters. India pulled into the lead just before halfway with Hannah hot on her heels and the rest of the group strung out behind. As the swim progressed so did the speed of the race and with 50m to go Hannah took the initiative and pulled to the front and into transition, shortly followed by India, Austin, Michael and Kai. Fabes then took the lead and with Kai not wanting to get left behind, he flew out of transition and headed after Michael, catching him towards the end of the first lap and leading into the second. With Hannah, India and Austin sitting out the run due to future race commitments, the door was opened and Bev Holmes and Sharkie Jaggard stepped straight through, with Bev taking the early lead on the run in the women’s race and Sharkie holding 3rd in the men’s. However, it was 2014 series champion Mel Brookes who used her run strength to catch Bev and take victory in the women’s race with Bev in second and Faye Bartlett in third (in her first ever Aquathlon after giving birth just seven months ago!). In the men’s race Michael managed to catch Kia and take the victory, with Kia holding on to second while Clarke Schofield moved into third with a great run performance. 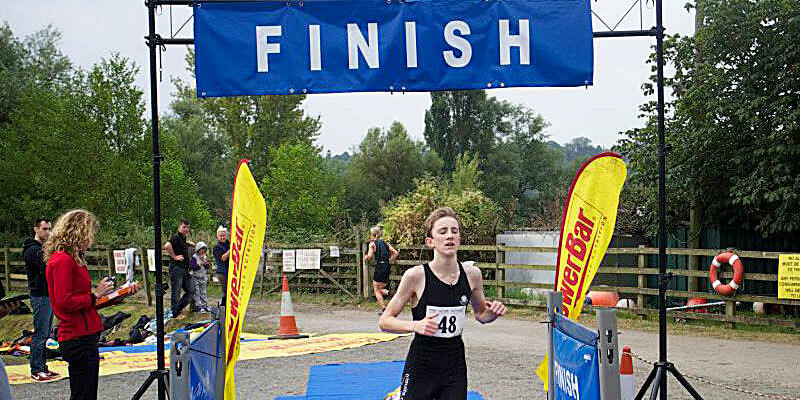 Some standout performances today including from Kai Furnell-Brennan who, at aged 14, not only came second overall and first junior but also smashed his swim, run and overall personal best times on this course – which is a tough feat at the start of the season when the water is only 13.5 degrees! Special mention also must go to Neil Turner, Steve Oliver and Andrew Fox and all our other first time multi-sport competitors. With five races left in the series it will be great to see how fast they can all go! The aquathlon series provides a great opportunity to experience the race environment, in a friendly relaxed setting. Our next aquathlon is on Saturday 30th May – enter online here. The Triathlon Training Centre holds events and training sessions all summer long see www.triathlontrainingcentre.co.uk for more information. A history of previous race reports and result can be found here.